A team of volunteers pored over observations from NASA's Spitzer Space Telescope and discovered more than 5,000 "bubbles" in the disk of our Milky Way galaxy. In this case, human eyes are very good at spotting what computer programs often miss. The volunteers were able to identify partially broken rings and overlapping bubbles that would have confused algorithms. To make sure the volunteers identify likely bubbles, the program requires each candidate bubble to be flagged by five participants before it's added to the catalog. "The Milky Way Project is an attempt to take the vast and beautiful data from Spitzer and make extracting the information a fun, online, public endeavor," said principal investigator of the Milky Way Project Robert Simpson, a postdoctoral researcher in astronomy at Oxford University in England. 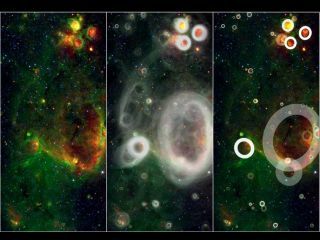 Astronomers hope to use this collection of cosmic bubbles to study star formation in the galaxy. The results are already turning up some surprises, such as the fact that bubbles seem to be less common on either side of the galactic center. "We would expect star formation to be peaking in the galactic center because that's where most of the dense gas is," Bressert said. "This project is bringing us way more questions than answers." The study is detailed in a paper submitted to the Monthly Notices of the Royal Astronomical Society.